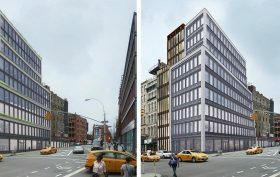 Less than a month ago, the Landmarks Preservation Commission asked contextually proficient architect Morris Adjmi to modify his design for a 10-story, terra cotta office and community facility building in Noho. The site, at 363 Lafayette Street within the Noho Historic District, is controversial for the fact that it’s adjacent to the live/work studio of artist Chuck Close, who filed a lawsuit in 2008 against the previous owner to prevent construction of a different office building that would’ve blocked his loft’s natural light. Yesterday, Adjmi presented a revised version of the project, which the LPC this time approved, reports New York Yimby. The new design eliminates the five two-story setbacks and opts for slightly angular, less dramatic, floor-by-floor setbacks. 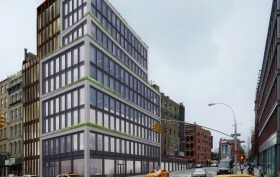 In February, 6qft reported that Ironstate Development was forging ahead with plans to build a nine-floor, 46,000-square-foot office and community facility building at 363 Lafayette Street in Noho. The long-vacant parcel sits adjacent to the live/work studio of artist Chuck Close at 20 Bond Street. 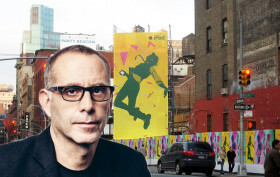 In 2008, he filed a lawsuit against the previous owner to prevent the construction of an office building that would’ve blocked his loft building’s natural light, which he argued the artists depend on. Squarely sited in the recently extended Noho Historic District, the Morris Adjmi-led design came before the Landmark’s yesterday aiming to compel the commission on the aesthetic soundness of their proposal. Ultimately the LPC decided to table the design and asked Adjmi to return with modifications.